Rather than plugging your mobile phone into a traditional mains powered USB charger/adaptor using a Micro-USB cable, this QI charging pad allows you to plug in the charging pad then simply place your smartphone on top of the pad and it will automatically begin to charge with no fiddling around with cables. Then when your phone is fully charged, you just grab the phone and go, as you can pick it up and begin using it without any disconnecting! The Choetech charging pad retails at under £20 from major online stores such as Amazon so it is not the cheapest wireless pad out there, but it is one of the better choices. Unlike some wireless charging pads which can be fussy about how you place your phone on them, this Choetech Wireless Pad is much less particular and will accept the connection when placed on top at almost any angle, just throw down your phone and the charging begins with no fuss. The connection can also be established without removing your phone case as long as it’s no more than 5mm thick. The Choetech unit features a minimalistic design, a compact circular pad finished in a silver aluminium plate with Choetech logo and surrounded by a white rim with blue LED ring. This charging pad has a real quality feel with some nice touches such as the built in Lighting sensor and three transmitting coils to increase the wireless charging area with full directional power. 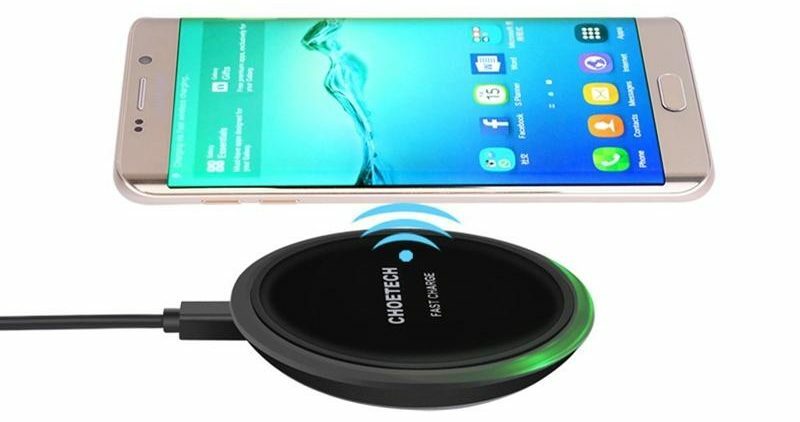 This Choetech Wireless Charging Pad works with all fully QI-enabled devices including the Nokia Lumia 920/928/1020, HTC Droid/Rzound/Incredible, Google Nexus 6/4/5/7, Samsung Galaxy Note 4/S5/2/3/S4/S3/, iPhone 6/5C/5S/5/4/4S and the Nokia 925/720/820.